This Internet site and its contents, however – unless otherwise stated – belong exclusively to CSP – innovazione nelle ICT s.c. a r.l. (© Copyright CSP – Innovazione nelle ICT s.c. a r.l. 2016 – All rights reserved) and are protected by enforceable laws, although CSP will use Creative Commons licences to favour distribution for documents and material whenever possible, or at least indicate more detailed conditions of use compared to those generally applied. By “Site” we mean web pages (considered both individually and as a group including their physical appearance and contents) within the dominion www.csp.it, its layout and graphic contents, html code and structure, organisation, choice of contents, coordination, its look and feel, the technologies and programmes, processes and methods used in order to manage the Site and, in general, all those elements that make up the Site. Site of any nature (including, for example, written text, research, reports, articles, presentations, graphics, documents, audio, video, photographs, single o sequences of moving images, drawings etc) and, in general, information and contents on the Site different from the elements making up the aforementioned Site, belong fully and exclusively to CSP – innovazione nelle ICT s.c. a r.l. (© Copyright CSP – innovazione nelle ICT s.c. a r.l. 2016 – All rights reserved), which holds the relative copyright worldwide and throughout the entire length of legal protection, or is, at least, owned by parties who have drawn up specific agreements with CSP – Innovazione nelle ICT s.c. a r.l., and any use of them that is not specifically permitted, is to be considered forbidden. The above-mentioned Authors are indicated on the Site with conditions of use, by and according to law. CSP – Innovazione nelle ICT, trademarks, company names, logos, and, in general, distinctive signs used on the Site are totally and exclusively owned by CSP – innovazione nelle ICT s.c. a r.l. (®,™) or others and are protected by law. Any reproduction or use, are forbidden.  innovazione nelle ICT s.c. a r.l. will not therefore be responsible in anyway or for any type of damage, whether direct or indirect, deriving from the use or not of the Site and material published on it, whether considered singularly or as a whole. CSP – innovazione nelle ICT s.c. a r.l. invites users to send any communication, report of violation or request regarding using the Site’s material, including images, text, audio, presentations, graphics or other material, to innovazione@csp.it or contact CSP on 011 4815111. Reference linking to the Site is allowed. The pages on the Site must not be referred to or reproduced, either totally or partially, within other pages (framing), so that the source and document copyright holders cannot be recognised. Other Internet sites that can be accessed from the Site via links on the Site cannot be controlled by CSP – innovazione nelle ICT s.c. a r.l., and can therefore in no way be held responsible for the contents or services offered by those sites.